Nonlinear transient analysis (update the stiffness and mass matrix at each time step, apply forcing using beam elements which displace like the hydraulic cylinders actually used to apply the force). Very computationally expensive so no use in an optimisation loop! Both methods produce comparable natural frequencies and mode shapes, but the modal superposition fails to capture behaviour which is seen in real life. The plot below shows this. The red line is generated by modal superposition, the blue line is real test data (but is similar to what is obtained with the nonlinear transient analysis). If I do a linear transient analysis then the behaviour is as the red line - it seems like when the loading in the $M_X$ direction is in phase with the loading in the $M_Y$ direction, the modes create some extra loading (and the opposite thing happens) when the two modes are opposed to each other, which keeps the overall amount of energy in the system constant over time. Does anybody know of any less computationally expensive methods than nonlinear transient which may be able to capture this behaviour? I don't want to create a fudge ideally - I'd like a physics based result! Your numerical results for the transient response are as expected. Results obtained with the modal superposition method match very well with the linear transient analysis because you use the same stiffness matrix in both the analyses. However, when the deformations are significant i.e, in the finite strain regime, the results obtained with the nonlinear transient analysis would be significantly different from those obtained with the linear methods, be it linear transient analysis or modal superposition. You can not capture this nonlinear behaviour no matter how many modes you use in the modal superposition method. For stiffening materials, which are used in Engineering in general, the stiffness increases as it is loaded; hence, the frequencies will be little higher for nonlinear models. Therefore, when the material is deformed significantly, its natural frequencies and mode shapes would be different. You can verify this behaviour by computing the natural frequencies with the stiffness matrix computed after the end of non-linear static analysis. Even a 10% difference in the natural frequencies would result in a significant differences, as you observed, in the time response. This observation also reflects in your statement "Both methods produce comparable natural frequencies and mode shapes, but the modal superposition fails to capture behaviour which is seen in real life." "Comparable natural frequencies" is not the same as "exactly the same natural" frequencies. 1.) Instead of an implicit time integration scheme, you can use an explicit scheme, for example, the well-known Central Difference scheme. 2.) 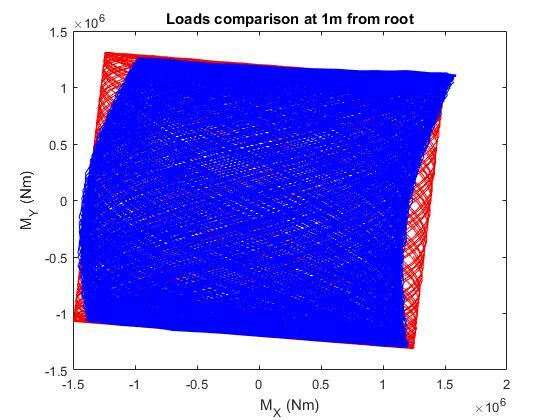 As you are interested in the design optimisation, your best option would be to use nonlinear normal modes (NNM), which is an extension of linear modal analysis to non-linear regime. I think that in NNM, instead of using the natural frequencies and mode shapes from the linear stiffness matrix, you use those corresponding to the nonlinear stiffness matrix. As non-linear static analysis, and modal analysis thereafter, is much less expensive than the full nonlinear transient analysis, NNM would be the best method for your task. I am not quite familiar with this NNM technique. I suggest you to refer to the relevant literature for comprehensive details on NNM. Not the answer you're looking for? Browse other questions tagged finite-element nonlinear-equations eigensystem numerical-modelling or ask your own question. When should a geometric stiffness matrix for truss elements include axial terms?